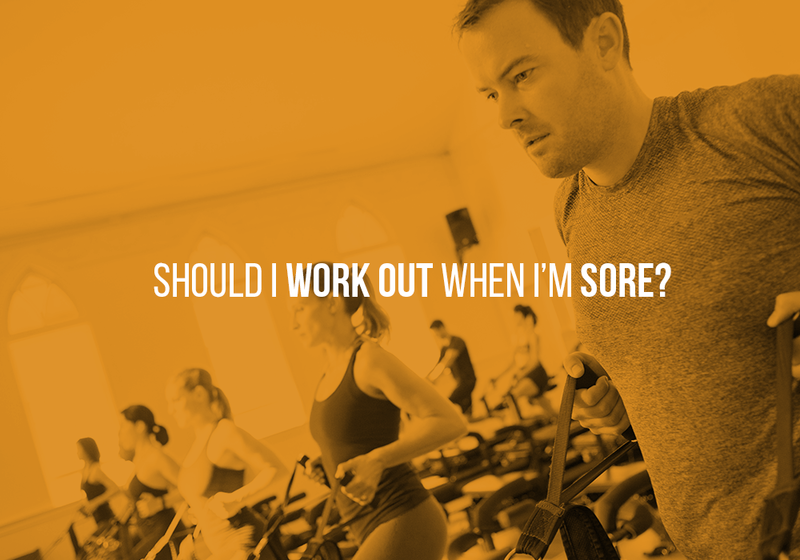 Should you still stick to your work out regimen even when you’re feeling sore? If you’ve ever had to cringe while laughing or squatting to pick up a pen after a tough workout, you are not alone. When your muscles are sore, it’s uncomfortable, which is great for your future self, but your current self might not be as pleased with the more immediate situation. Plus, if you’ve committed to a monthly package, wedding date, or good health, you probably want to take as many classes as possible, so the question is, “Should you still stick to your regimen even when you’re feeling sore?” It all boils down to recovery time and the type of workout you choose. Generally speaking, you don’t want to workout when you are already in pain, sure, but you should also consider recovery time as avoiding long term or permanent injury. When you’re building muscle, your muscles have minor tears which cause the soreness you feel, and you don’t want to exert too much force on an already torn muscle. You also don’t need us to outline why a major muscle tear is a bad thing. You can measure your pain on a scale from 1-5, and, if you decide it’s above a level 3, you should give your muscles longer to recover. Plus, if you are feeling sore and you still want to workout, it’s better to do a workout that utilizes smaller muscles than a heavy exertion workout. Some workouts are lower impact on your joints and use slower movements (like CORE40 or Yoga), where you work smaller muscles that in technical terms are called “slow twitch muscle fibers.” On the other hand, with heavy lifting or sprinting, you are working “fast twitch muscles,” or bigger muscles. Based on your level of soreness, your body typically requires 1-2 days of recovery for small muscles and 3-4 days for bigger muscles. Basically, the more weight you add or sprints you run, the more time you’ll need to recover from a workout, and if you’re feeling sore, you should refrain from heavy exertion exercises. Building muscle takes time, and you won’t get washboard abs if you work out 7-days in a row. Unless you go to the doctor for being sore and to seek advice, you are the number one decision maker on whether you should workout with sore muscles. Plus, to make that decision easier, if you enjoy working out on a more consistent basis, you can focus on your slower twitch muscles that take less time to recover. Overall, balancing your commitments with some body awareness will keep you healthy, happy, and less confused about muscle soreness.